6. How do DGCR8 and Drosha Structurally Recognize Pri-miRNAs? 7. How Is Pri-miRNA Processing Regulated? 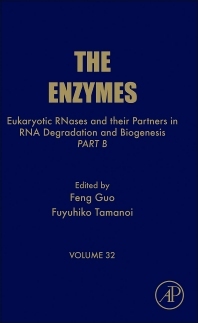 This special volume of The Enzymes is targeted towards researchers in biochemistry, molecular and cell biology, pharmacology, and cancer. This thematic volume discusses Eukaryotic RNases and their partners in RNA degradation and biogenesis. Fuyu Tamanoi is a biochemist who has served on the UCLA School of Medicine and UCLA College faculty since he joined the Department of Microbiology, Immunology & Molecular Genetics in 1993. He became a full professor in 1997. Since 1996, he has been a Director of Signal Transduction Program Area at Jonsson Comprehensive Cancer Center. Dr. Tamanoi earned his B.S. and M.S. in Biochemistry at the University of Tokyo. He received PhD in Molecular Biology at Nagoya University in 1977. He was a postdoctoral fellow at Harvard Medical School, where he worked on bacteriophage DNA replication. From 1980 to 1985, he was a senior staff investigator at Cold Spring Harbor Laboratory, where he worked on adenovirus DNA replication. From 1985 to 1993, he was an Assistant Professor and then Associate Professor at the University of Chicago, where he initiated studies on lipid modification of the Ras family proteins. His laboratory research centers on signal transduction and signal transduction inhibitors. He is currently exploring ways to deliver signal transduction inhibitors using nanoparticles.